Kampala — Bank of Uganda (BoU) and city property mogul Sudhir Ruparelia are in advanced talks to have the multibillion commercial dispute between them sorted out of court, Daily Monitor has learnt. The Shs397b commercial dispute had come up yesterday for hearing of three applications about it but the proceedings did not take place. Sources told Daily Monitor that when both parties appeared before Justice David Wangutusi, they asked him to give them more time to enable them continue the out-of-court settlement. "When the parties appeared before the judge, they informed him how they were in negotiations to have the matter settled out-of-court. So they asked the judge for more time like two months so that they conclude their ongoing negotiations which they say are in advanced stages and might yield fruit," the source told Daily Monitor last evening. Justice Wangutusi accepted their request and adjourned the case to April 3 for Mr Sudhir and Bank of Uganda to return with the progress on their talks. Lawyers from Kampala Associated Advocates (KAA), a law firm representing Mr Sudhir, businessman, yesterday remained tight lipped of what transpired in court. "The reasons for adjourning the matter are confidential... ... ... " one of Mr Sudhir's lawyers said. The court had been expected to hear an application in which BoU is seeking to amend its pleadings against Mr Sudhir. In the second application BoU is seeking to be allowed more time to file its defence to counter the suit filed against it by Mr Sudhir. The third application that had been expected to be heard yesterday was that of Mr Sudhir seeking court to dismiss BoU case against him. 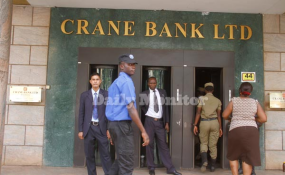 The central bank sued Mr Sudhir and his Meera Investments company in 2017 for allegedly fleecing his self-owned Crane Bank of Shs397b in fraudulent transactions and transfers. Crane Bank was closed by the Central Bank and later sold off to dfcu Bank. Mr Ruparelia denied the accusations and counter-sued the Central Bank, seeking compensation of $8m (about Shs28b) in damages for alleged breach of contract. The Commercial Court's rules require that every case goes for mediation first and it can only go on full trial if the mediation fails. In this particular case, there had been earlier attempts by the Principal Judge Yorokamu Bamwine to mediate between Bank of Uganda and Mr Sudhir but the deadline ran out in July last year. Justice Bamwine returned the file to the head of the Commercial Court for further advice on how to proceed.